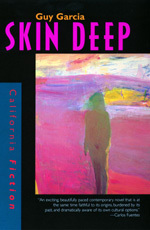 The narrator of Skin Deep is David Loya, a second generation Chicano from the East L.A. barrio. With a degree from Harvard Law School he is a rising star in a major New York law firm. He returns to L.A. in response to an urgent request from a Harvard friend to find a missing illegal Mexican named Josefina Juarez. David's search for Juarez takes him deep into the barrio where the mystery of her fate upends his world and forces him to confront long-buried questions about family, love, friendship, and his own identity. Skin Deep is a novel about coming of age in the new America, a place in which races and cultures have not so much melded as collided and in which no identity is secure. Garcia chronicles this new urban landscape with acuity and informed sympathy. Guy Garcia was born in Los Angeles and attended the University of California at Berkeley. The author of the novel Obsidian Sky, he is a contributor to the fiction anthologies Iguana Dreams and Pieces of the Heart, and lives in New York City.